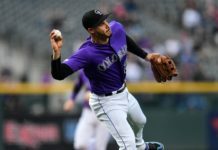 Every year, Major League Baseball presents a player with what it calls “the most prominent individual player award bestowed by the MLB” through the Roberto Clemente Award, and at the beginning of September, the league announced that Colorado Rockies outfielder/first baseman Ian Desmond was named a nominee for 2017. Ian Desmond easily checks off those boxes. For the past five years, Desmond has become an integral part of the neurofibromatosis community, helping raise awareness and making generous donations through national organizations like the Children’s Tumor Foundation. Earlier this season, he donated $16,000 to the cause, and is very active on Twitter in spreading the word about NF to his 25.9K followers. The disease affects roughly 1 in 3,000 people worldwide. 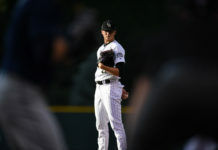 In a letter published on indiegogo.com during Desmond’s Washington Nationals days, he spells out exactly how devastating the disease can be. For Desmond, it all started with Ethan Brown of Liberty, S.C. in 2012, when Desmond found him on social media. “He had a big surgery coming up. I think it was a brain surgery and basically from that point on, we became really close friends. I’ve seen the way that it affects him, I’ve seen him go through quite a bit physically, emotionally, and his family, the same. I think we all as players want to make an impact, and at that point I had a high-school diploma, my family’s relatively healthy, and I just felt like all I could give back was to baseball. Since then, he’s made a huge impact not only in Brown’s life, but in the NF community, both in the spotlight and out of it. “He’s a huge help,” Brown said. “He is my ‘big brother.’ I tell him everything that’s going on with my life. He gives me advice on things and honest answers to questions, and not just answers I want to hear. Since their friendship first blossomed some five years ago, Desmond’s voice has gotten louder and louder in the NF community, and he’s being heard nationwide. Over the years, Desmond has become a huge asset to the Children’s Tumor Foundation, a nationwide NF community and nonprofit organization surrounding NF. 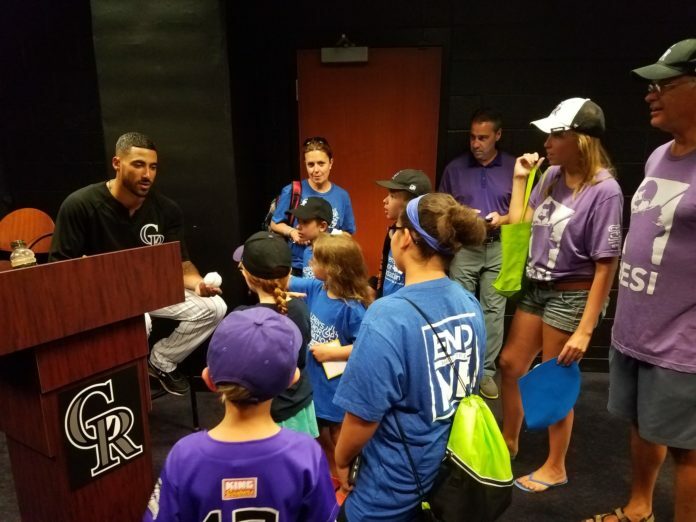 In the short time he’s been with Rockies, Desmond has already made huge waves with the Colorado chapter of CTF. From that day forward, Desmond has donated 20 tickets to NF families for one game each month of the 2017 season, something that’s become a nice escape for the kids and families who must deal with so much. Every time, the 20 people who hail from all over Colorado, Utah and Wyoming get to have a “media day” with Desmond, as he interacts with the families and signs Rockies memorabilia for his guests. Since Desmond’s arrival in Denver and through his work with the NF community, Lynn said he’s seen an uptick in awareness for neurofibromatosis through various online articles written about Desmond’s involvement, and a TV segment done during a game on (what was formerly known as) Root Sports. That, Lynn said, has accelerated the conversation in his own social circles and beyond. With all the great work he’s done in the NF community and with CTF alone, Desmond has become a beacon of light in raising awareness and funds for research surrounding the disease. Much like Roberto Clemente himself–who literally lived and died trying to help those who needed it most–Desmond exhibits the compassion, drive and community outreach that this award tries to illuminate in the baseball world. Although the competition for the award is tough this year, Desmond has more than earned his spot in the pool of nominees.